I have a goal to declutter my life and that includes deleting 100 emails a day. The other day, I spent two hours deleting emails. I felt no satisfaction from doing this task. 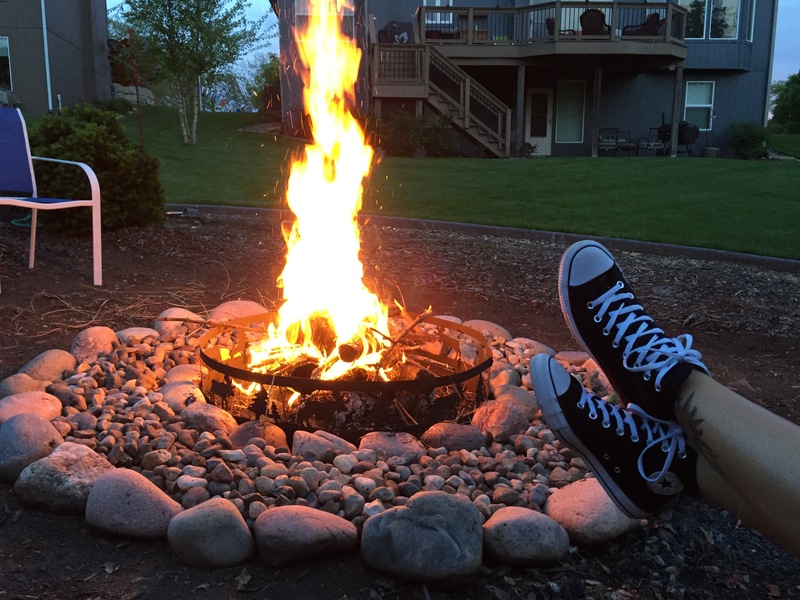 My husband Ken and I had decided to have a fire outside in our fire pit later that evening. As I sat deleting emails, I was looking forward to getting outside. I had a headache and knew I’d been on the computer too long, but still, I looked at every email before deleting it. As soon as it got dark, Ken built a fire, and we sat by it with a glass of wine. We talked about the adjustments we’ve made this past year. He is newly retired, we became empty-nesters, and our dog died. But we have been making the best of things. He has been painting rooms in our house. We have been seeking out live music. We have planned some trips. Sitting by the fire and chatting was far more satisfying than deleting emails. I felt relaxed, and my headache disappeared. I felt happy. The next day, I thought about my goal to delete 100 emails a day. Was I willing to trade another two hours of my life to clear out emails? I wasn’t. Instead I deleted a bunch of emails in a mass delete. In the future, I will be more particular when subscribing to email lists. Frittering away too much time on the computer is frittering away part of my life. I’d rather enjoy life while I can. I learned that lesson years ago from a coworker, Don. He invited our softball team to his cottage on a lake in Wisconsin, where he owned wooded property. We went out on his boat, sunbathed, barbecued, and enjoyed being with friends. I asked Don if he went out on his boat often, and he said, “No. When I come up here, I’m usually fixing things up. I will enjoy it when I retire.” He was only about 40 at the time, but he knew how many years, months, and days until he would retire. Unfortunately, a couple of years later Don was diagnosed with cancer and subsequently passed away. He never did get to enjoy his retirement in Wisconsin. Do you enjoy the things you have? If you have a porch, do you sit on it? If you have a fireplace, do you use it? I am guilty of that one. Our house has a fireplace, but we seldom use it. When we think of the happy moments in our lives, we tend to remember big events—our wedding day, the birth of our children, a graduation. Or we look forward to future events. The day we retire. An upcoming vacation. A holiday. But what about today? Surely we’ve had moments of happiness. Let’s enjoy the present moment and look for bright spots in our days. Our lives are a gift to enjoy. Yes, we face challenges and dramas and bad times. Life is not 100% joyful. But that is all the more reason to appreciate the happy moments. I am usually happy when I’m in nature. That crackling fire. A river rushing over rocks. A visit to our arboretum. I am also happy when I’m with family and friends. The other day, my husband Ken and I enjoyed a 4-mile hike at a forest preserve. We passed a small lake, a creek, and a marsh. Birds were calling and leaves were rustling. And today, Ken and I walked for two miles in a nearby subdivision. It was a beautiful day. We explored and looked at landscaping. These were moments of happiness. The little moments can make us happy. . . or not. How are we spending our little moments? Are we staring at a computer, TV, or cell phone? Are we fretting over little things—like the fact that it’s raining or too hot? Do we seek out happiness? Let’s try to appreciate small moments rather than always thinking of our do lists. When have you felt happy recently? What would make you happy this summer? This entry was posted in Happiness, Nature, Proactive and tagged Happiness, Nature, Proactive. Bookmark the permalink. I was just delighting in taking down the wash while the birds are singing, the air is fragrant with lilacs, the sun is warm…these are the precious moments! Thanks. And you’ll have the added bonus of fresh-smelling laundry from hanging outside. It all sounds lovely. I hope you have a great summer–sounds like you will! This is truly a post after my own heart! Sounds to me like you have found JOY in many places and with the small things in life. (Email is something to tackle. I think part of that problem is once you sign up, they send emails almost daily if not every day. So It piles up!) I have this tendency to hang on to them too long since you never know when you might use that trusty coupon, right? Thanks for sharing your point of view and insight into the importance of choosing happiness and JOY right now. My husband and I truly enjoy our backyard and deck. I call it my favorite room in the house. Our shady yard and shade gardens with small waterfall and and fountain make me feel very peaceful and relaxed. When we meditate in my yoga class and I am told to go to my favorite place on the beach or mountaintop I instead go to my back yard in my mind. My husband and I spend many evenings relaxing on our deck in the summer. It takes a fair amount of work to get it to an enjoyable point but then we coast all summer long. I have recently begun to babysit my first grandbaby once a week. I could be stressing over all the things I can no longer get done because I’ve given up one of my free days all week. Instead I have decided that I will just enjoy him as much as I can. He is so sweet and happy and I love to watch him grow and learn. Such joy! Yes, it’s a challenge to keep up with a one year old and I’m not used to it. Yes, I am giving up a lot of my free time. But oh what joy! That makes me smile, Cathy, thinking of you and Phil enjoying your beautiful, peaceful deck and yard. And I can only imagine the joy of a grandchild. I’m glad you’re relaxing and enjoying the pleasures of having such a cute grandson. Sue, this was a great article. Simple things make me the happiest also, including being with family, friends, and in nature…You made a great point about all of the emails that can accumulate. The hummingbirds have arrived. As soon as I saw the first one I squealed with childish glee! Family, friends, a good meal with family or friends, and nature! All bring me joy and I relish the small moments. I needed to be reminded of this and I thank you for it. Penny, that made me smile picturing you squealing upon seeing a hummingbird. You’re right. I saw a pretty butterfly yesterday and now I remember as a kid being so excited to see a butterfly–even to following it for awhile. Thank YOU for the reminder to notice such things.